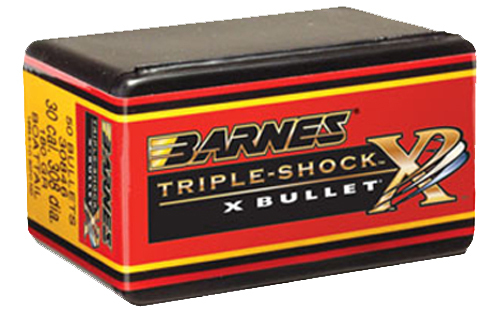 Barnes' TSX (Triple-Shock X) Bullet features include all-copper construction, no fragmentation, 28% deeper penetration than lead core bullets, and maximum weight retention. The TSX bullet has multiple, precisely engineered rings cut into the bullet shank, acting as relief valves while the bullet travels down the bore which results in improved accuracy, reduced pressures (for higher velocity loads), and less copper fouling. This is a good bullet for a 22 cal. and the price and shipping charge from hinterlandoutfitters is also great.